Estimates of the number of people in the world who suffer from depression are staggering – perhaps up to 340 million cases. Your doctor at Hinterland Chiropractic wants to spread the word that taking one simple step can dramatically lower the risk of developing depression; that is to avoid junk food. Your Gold Coast chiropractors encourage patients to embrace the chiropractic lifestyle, which includes regular chiropractic visits, exercise, stress reduction, and nutrition. All of these components fight a variety of diseases, including emotional problems such as depression. Read on to discover how avoiding junk food may keep you and your family depression free. According to a recent study (Public Health Nutr 2013;15:424-32), which tracked nearly 9,000 patients over an average of 6 years, fast food such as hamburgers, sausages, donuts, and pizza, fast food consumption increases the chance of developing depression by 51%. 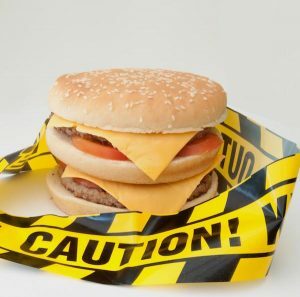 Your Hinterland Chiropractic doctor is frequently asked why junk food is related to depression, and the answer includes the idea of “good” fat versus “bad” fat. A study in Spain (PLoS ONE 2011; Epub) followed 12,059 people for six years. During the course of the experiment, 657 people developed depression. Among those who consumed trans-fats (unhealthy) the rate of depression was 48% higher than among those who did not. Subjects who consumed polyunsaturated fats, like olive oil, had a lower risk. Study lead author, Miguel Ángel Martínez-González, noted, “the more trans-fats were consumed, the greater the harmful effect they produced in the volunteers”. A study in the British Journal of Psychiatry identified a ‘good’ link between a whole-food diet and resistance to developing depression. Information on 3,486 middle-aged workers was pooled and two dietary patterns were compared; a whole food diet (vegetables, fruit, and fish) and a processed food diet (artificial sweeteners, fried foods, processed meat, refined grains, and high-fat dairy products). The workers who ate whole food were 58% less likely to develop depression compared to those on the processed food diet (Br J Psychiatry 2009;195:408-13). The relationship between junk food consumption and depression was also found in younger subjects. Researchers studied 7,114 adolescents from 10 to 14 years old. The scientists discovered that those with the poorest quality diets were 79% more likely to be depressed than their peers on the healthiest diets (Aust N Z J Psychiatry 2010;44: 435-42). Another study followed 3,040 adolescent girls. The study showed that the better a subject’s diet, the less likely she was to suffer from depression. Further, “Improvements in diet quality were mirrored by improvements in mental health over the follow-up period, while deteriorating diet quality was associated with poorer psychological functioning” (PLoS ONE 2011;6:e24805). Similarly, researchers at the University of Alberta, analysed 3,757 10 and 11 year old children in Nova Scotia. In this case, dietary variety was found to be associated with lower levels of depression and anxiety (Public Health Nutr 2012;14:1). While avoiding junk food is a good step to avoid depression even more protection against the blues, can be found in the “Mediterranean Diet Pattern” (MDP). The MDP is high in fruits, vegetables, nuts, legumes, olive oil, fish and whole grains as well as small amounts of lean meats and dairy. The MDP excludes fatty meats, processed foods, fried foods and processed grains. One study tracked more than 10,000 people who did not have depression. The subjects on the MDP were discovered to be nearly 25 percent less likely to develop depression, compared with those with the least adherence to the MDP (Arch Gen Psychiatry 2009;66:1090-8). See Us at Hinterland Chiropractic! At Hinterland Chiropractic we provide holistic advice and treatment for a variety of health problems including depression. We are always happy to see new patients! Visit us soon and receive a COMPLETE Consultation and Examination. Yours for ONLY $45! Call us today on 07 5527 3133 or book your appointment online.